Here’s some more flowers the bees are visiting. 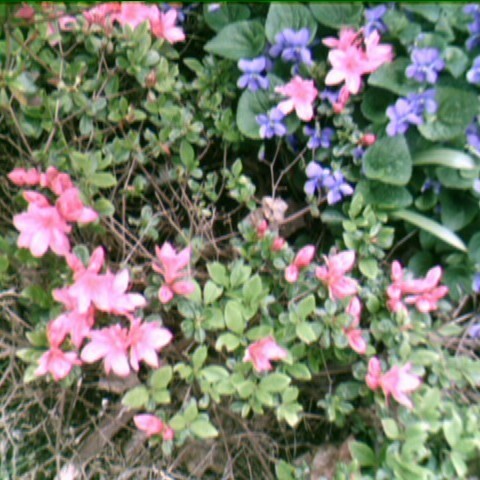 Not to mention another example of why the violets get free rein in my yard: they look nice next to the azaleas. Yesterday I thought I saw a bumblebee, but its buzz had that whiny fly quality. Probably a syrphid fly; they look a lot like bees or wasps. They’re even pollinators like bees and predators like wasps. Good guys, but fast-moving so I rarely get a close look. Then it lit down long enough for me to get a close look. It was fuzzy like a bumblebee, but the light striking its abdomen came off in a luminous, golden honeybee quality. It only had two wings, and most tellingly, instead of a bee’s long antennae it had that tiny little radar array on its forehead–just like a fly. I don’t have my own picture. but based on this gallery from bugguide.net”, it’s Eristalis flavipes. Update: It was a Narcissus Bulb Fly. Then the syrphid fly did the weirdest thing. It laid its two wings close together so they nearly covered its body and emitted a piercing whine. I didn’t even realize where the sound was coming from until it stopped as the wings parted. Then it flew away, off to do important good-bug business.